Apple users with a closet love for Windows 10 can finally see their dreams come true following the latest release of Parallels Desktop for Mac. Parallels Desktop 10 lets Mac owners choose the Windows 10 Technical Preview as one of the options alongside the regular Windows .iso files, Chrome OS and Ubuntu. 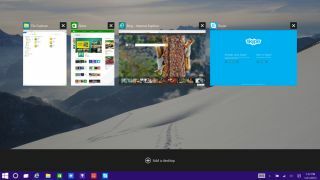 It works by creating a virtual machine on the Mac in question that allows every Windows 10 Technical Preview feature to be tested out: including the new Start menu, Cortana, Photos, Maps and a beta version of the Windows Store that stocks Office Preview for Windows 10. The program comes with a two-week free trial straight off the bat. After that Parallels Desktop 10 will set you back $79.99 (around £51.99, or AU$103.14), whereas the student edition comes in at $39.99 (around £25.99, or AU$51.56). Anyone that already owns Parallels Desktop 8 or 9, meanwhile, will have to cough up $49.99 (around £32.49, or AU$64.46). It's anticipated that Windows 10, which became available as a preview for smartphones earlier today, will be released to manufacturers in June before eventually hitting new PCs that are released in the lead-up to the new school year in September.